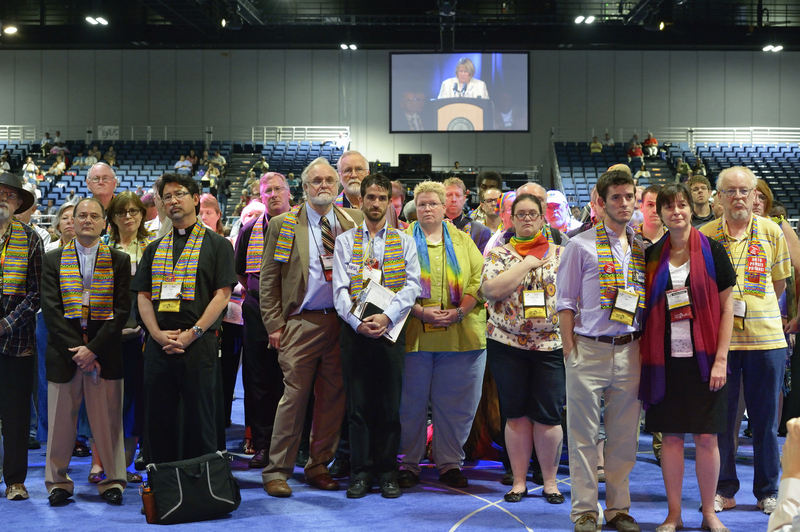 The United Methodist Church’s quadrennial General Conference took place in Tampa, Florida from April 24 to May 4. Austin members of our SWTX-MFSA Chapter who were in attendance for a portion or all of the conference were Robbie and Tom Ausley, Richard Bates and Joe Santoyo, Joy Butler, Janice and Rowland Curry, Deana Henry, Sid and Angela Hall, David Mauzy, Anne Mund, Anita Privett, Sarah Howell (Delegate) and Jay Brim (Delegate). What can we say? Despite the efforts of hundreds of Love Your Neighbor Coalition leaders and volunteers, social justice issues got beat up pretty badly at this GC, and it could have been worse if not for our efforts. In our Tabernacle, we sang, prayed, planned, took Communion, heard inspiring messages, met new friends, and ate well. Across the street, we had songs, flash mob dances, street theater, candlelight vigils, silent witnesses, non-so-silent protest demonstrations (no arrests!). On Sunday, the Coalition presented a wonderful worship service featuring Rev. Dr. James Cone, author of “The Cross and the Lynching Tree”. In the meeting rooms and plenary hall, we were subjected to hateful language and found ourselves losing ground instead of making inroads to a more inclusive church. By the first week’s end, it was clear that we needed to switch to defense to block further erosion of social justice. At one point, a proposal to add language to the Social Principles that “God’s grace is available to all – nothing can separate us from the love of God in Christ Jesus” passed – but only by 56%! [Read that last sentence again!] In the end, a great number of petitions and resolutions that would have done even further harm were not considered on the plenary floor as time ran out. The restructuring of the UMC ran into its own problems. Three major plans – the Call to Action, MFSA Plan, and “Plan B” were all defeated in committee, leading to the development of “Plan-UMC”, which was passed by the conference. However, based on an appeal by the LYN Coalition, the UMC’s Judicial Council ruled with 5 hours left in the conference that Plan-UMC violated the UMC’s Constitution. So the organization of the UMC continues as before.